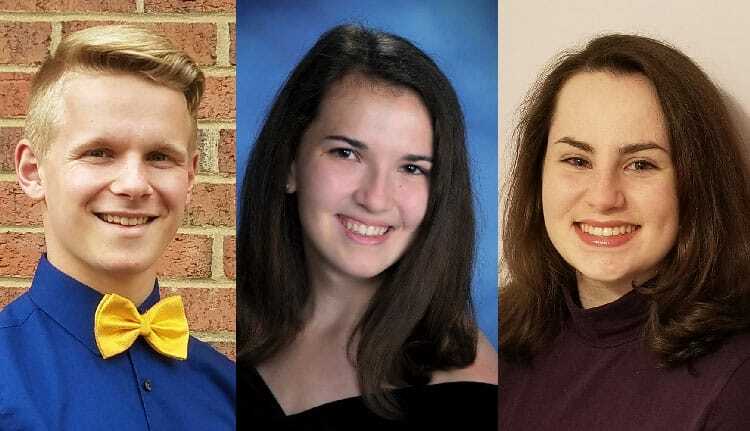 Matteo Stocco, Katie Svoboda, and Catherine McCaughey have been named the winners of Christendom’s 2019 Padre Pio Full-Tuition Scholarship competition. From left to right: Matteo Stocco, Katie Svoboda, and Catherine McCaughey. The three high school seniors stood out amongst a group of 76 finalists for the three full-tuition scholarships, writing exceptional essays and impressing college staff and faculty during the rigorous interview process. Together, the seniors will now each receive a four-year full-tuition scholarship to attend Christendom. Stocco, a native of Winchester, Virginia, who was homeschooled in high school, fell in love with Christendom after attending the Experience Christendom Summer Program. After just one week of the classes and the culture, Stocco knew Christendom was at the top of his college list. He achieved a 114 on his Classic Learning Test (CLT), impressed the panelists at the scholarship competition, and will now be a freshman this fall — a fact that excites him daily. Svoboda, like Stocco, attended the Experience Christendom Summer Program in 2018. Hailing from Arlington, Virginia, Svoboda first became interested in the college thanks to several of her professors at Oakcrest School who were alumnae. Seeing the caliber of Christendom graduates, and after meeting other staff and current students, Svoboda knew it was where she wanted to go for college. McCaughey, another homeschooler, is coming to Christendom from Nashville, Tennessee. Her cousin, Maria Bonvissuto, who herself was a Padre Pio Full-tuition Scholarship winner, graduated from Christendom in 2015 and encouraged McCaughey to consider it for college. After attending the Experience Christendom Summer Program, she decided to apply. McCaughey was impressed by the academic life and community she experienced during that one week and cannot wait to continue that journey over the next four years. The college also awarded $5000 runners-up scholarships to other exceptional Padre Pio finalists: Tom Baird, Sean Walker, Mary McCloskey, Constance Weber, and Kaelyn Marble.